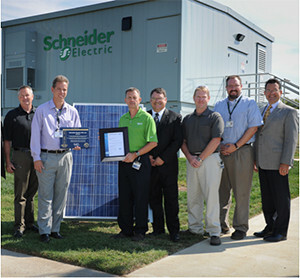 Veritatis Advisors global client Schneider Electric reports stunning success in deployment of its energy management strategy devised by VA’s Don Macdonald. It is always welcomed to see other reporting on your good work, at scale, of energy efficiency and uses of Standards to peel back layers of operational performance and change culture while meeting financial objectives and Wall Street expectations. Schneider North American CEO at the time, Jeff Drees and his team envisioned vertical integration of energy efficiency (EE) in all aspects of internal manufacturing and cross-fertilization of sales and marketing platforms leveraging the newly minted ISO 50001 and DOE’s Superior Energy Performance (SEP) program Standards. I recall Jeff Drees, “we are so far advanced in our market positioning and strategy development” DOE and competitors will be playing catch-up for years, recalls Don Macdonald who at the time was leading UL’s sustainability and Energy Management Practice. Early adopters are often faced with challenges and this was no different. The below article from Energy Manager Today shares these matured results and validates the early strategy and market savvy the team displayed. Don Macdonald (far right) joins the Schneider Smyrna team for a well deserved award. Reprinted from Carl Weinschenk of Energy Manager Today. Industrial facility energy managers with efficiency programs in place generally feel pretty good about themselves. After all, they are proactively addressing the issue and doing what needs to be done. They may not be doing all that can be done, however. During the past few years, the 3M Company and Schneider Electric have used two related initiatives – the International Organization for Standardization’s ISO 50001 and the U.S. Department of Energy’s (DoE) Superior Energy Performance program – to save significant amounts of money. The results have been gains in efficiency in the 60 percent range, even when the plants already had energy management programs in place. ISO 50001 is about creating a structure that everyone in the organization. This includes technology managers and those who deal with procurement, communications, operations, maintenance, facilities and other tasks. It also reaches up to top management. “It’s about getting these people to talk to each other and a more common approach to managing energy,” Scheihing said. Parallel requirements focus on communicating the message to all stakeholders, appropriately training staff and conducting internal audits. The goal is to assess results, gauge how the program is working and determine what the organization can do to improve. The DoE believes that it has a good story to tell. The results, according to data collected by the Schneider Electric and 3M, illustrate the comparative savings during the past several years of facilities using ISO 50001 and the SEP and those that didn’t. From 2011 to 2015, Schneider Electric claims that its energy efficiency gains rose 11.5 percent in plants that didn’t use either structure. Savings rose 19 percent at 20 plants that did. 3M saw its energy savings rise 6.5 percent in plants without ISO 50001 and the SEP – and 10.5 percent across the 18 plants that implemented the approaches. The program now is active at five additional plants. The level of savings of certified versus non-certified facilities was more than 60 percent for both companies. The average savings for the two companies over a three year period was 12 percent. An even more compelling element is that three-quarters of the savings were from “no cost/low cost” operational actions, Scheihing said. The DoE is trying to expand use of ISO 50001 and the SEP into the commercial sector and is working with Hilton and Marriott chains in an effort to create a beachhead in the hospitality industry. A move into the federal sector also is on the radar. Such expansions likely will be in steps. ISO 50001 initially would be implemented alone. The SEP, with its focus on quantification of financial gains, would be added later.